My friend Tom, who is a professional comic book writer, called recently. He was telling me about a new comic project he was writing, and the topic turned (naturally) to artists. Tom (not his real name) had discovered a talented new penciler who seemed too good to be true. Dynamic figures, realistic backgrounds, a solid sense of storytelling. One of those rare art talents that a writer dreams of discovering just before convention season. Then he told me who it was. I knew the name…in fact, I’d “discovered” the very same artist almost a year ago. Tom was intrigued…what had we done together? Artist X and I had TALKED about working together. Hey, I even wrote a script for him. But for some reason, this young, eager artist never managed to turn in any pages. I think I got a nice sketch, but after that, nothing. Nothing, no emails, no phone calls, no explanation. And then one day he announced that he was going to concentrate on his proposals for Marvel. So, I’d wasted a few weeks writing up a complete script, which was tailored to his art skills. Needless to say, I was bummed that I’d wasted my time and energy on a project that never saw completion. Tom fell silent for a long time. This wasn’t the kind of thing a professional writer wanted to hear. Nobody wants to write scripts that sit in a drawer, especially when you can use that time to write something that will get published. Then Tom perked up, and mentioned yet another young talent he’d found online. And that was it. That’s how an aspiring artist with potential lost a job without ever knowing it. All it took was that one short phone call. Here’s the important part: I didn’t go out of my way to ruin Artist X’s reputation. Heck, I never even THOUGHT about Artist X anymore, until my friend mentioned his name. And as you know, the comic book business is built on names and relationships. When I was trying to break into this business, comic books seemed to be unfathomably large. And maybe at the time, maybe it was. It was a bigger business 20 years ago. But now the comic book industry is a cozy, little business where most everybody knows everybody else. I’ve seen a lot of people come and go over the years, but one thing remains constant: People talk. Much of the American comic book industry is clustered in a few places on the map. There’s a whole lotta people in the New York/New Jersey area, mainly because of Marvel Comics and DC Comics. There’s a bunch out in California, mainly because of Image and – pretty soon – DC. Most of the career freelancers work in small home studios, emailing, FTPing, and FedExing their work. But nobody is more than Skype or text message away from news and information. And it’s not because this is a business full of mean, rotten people; not at all. It’s because there are so many nice, friendly people that they like to stay in touch. Most people know about the freelancers triangle, which I wrote about in my book Creating Comics from Start to Finish. The points are “Good,” “Fast,” and “Cheap.” But years ago, I was told that there is an extra/intangible point, which is “Likeable.” If nobody likes working with you, they may find someone of equal capabilities that they do like to work with. Fans are often surprised when they meet a famous pro who is “really nice.” Of course they’re nice. Part of their success is probably credited to their personality. Simply put, people enjoy working WITH them. It’s a crucial ingredient to success. 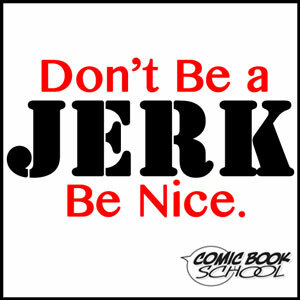 In reality…fans should be surprised if they meet a successful comic pro who is NOT nice. It’s rare that a real jerk will break into the business and make comics a long-term career. It’s possible, but for the most part, the comic book business is comprised of a lot of genuinely nice people. And if someone is a jerk, everyone knows it. Seriously, word travels fast, both positive and negative. Just like it did when my friend called the other night to tell me about Artist X. Your parents probably taught you some basic manners, including to chew with your mouth closed and to be nice to other people. Like a lot of stuff they taught you, that’s good advice in life and in your career. You’re not going to get along with ever collaborator, but you should act like a professional. You don’t have to let people walk all over you, but you should consider how your actions and words will be interpreted by others. We all make mistakes, but being nice is usually a good career strategy. As I mentioned, I wasn’t trying to hurt Artist X. I never talked about him, in fact I’d all but forgotten about him. But when Tom mentioned Artist X’s name, I recalled my personal experience with him. End of story. For Artist X, at least. Incidentally, Tom shared some links and portfolios of other artists. The good news is that he actually found a talented artist, and they’re working on a comic book together. People have good memories, especially for bad experiences. And this business is so small, that you cant really afford to screw people over, especially if you’re trying to break in as a writer or artist. Everyone talks, so be nice, act professionally, and keep your promises. And if you’re a jerk, eventually everyone will know. Out of curiosity, did you ever find out why “Artist X” never returned your calls, other than speculation that he blew you off? Might there have been some possibility that there were some unclear expectations or problems in communication, and “Tom” just casually wrote off this person without even trying to confirm that he’d be a problem? Sounds like “Artist X” wasn’t the only one with courtesy issues. Fair question. I streamlined the story, but this thing played out over several months. In this case, the artist had decided to focus on submissions to Marvel because he’d heard that they were looking for artists. This is probably true, since Marvel and DC are always on the hunt for great art talent. If you don’t want to be on a project or want to focus your energies elsewhere, you can do it in a timely manner. It may feel awkward, you should always communicate, even if it’s just a quick email. It’s not really fair to leave someone hanging. As for Tom, I imagine he just wanted a good collaborator. If you hear that someone agrees to something, changes his mind, and stops communicating, you may not want to invest yourself into that relationship. You’re looking for someone that shares your creative vision and work style.